In 2016 Bishop Alan Hopes invited the Community to run Dowry House Retreat, a new facility of the Shrine of Our Lady of Walsingham, ‘for the shrine, for the diocese and for the nation’. 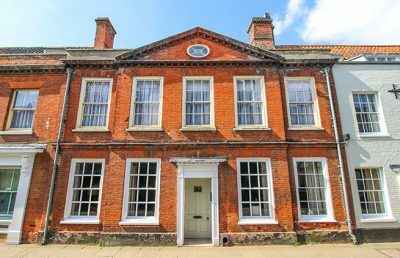 Dowry House Retreat is known affectionately to many as ‘the old Sue Ryder place’ and is situated directly opposite the Priory Gatehouse in the High Street. Built between 1470 and 1496, the twelfth-century Augustinian Priory used it as a pilgrim hostel, providing hearty meals and warm lodgings. During the 15th Century, Walsingham enjoyed the reputation of being one of the world’s most renowned shrines – up there with Jerusalem, Rome and Santiago de Compostela – and of all these, Walsingham was the only one dedicated to Our Lady. So pilgrims came from far and wide to honour Our Blessed Mother. The religious landscape of England changed dramatically during the Reformation of King Henry VIII and in 1537, as churches throughout England were desecrated, the Priory at Walsingham too was dissolved and the grounds passed into the hands of the King, despite the fact that the Priory was one of the first religious houses to sign the Oath of Supremacy in 1534. The Prior was rewarded with an annual pension of £100; however, the sub-prior refused to sign the oath and so was assigned the fate of being hung, drawn and quartered on what posthumously became known as Martyrs’ Field. Tradition states that the sub-prior, Canon Nicholas Mileham, was held overnight in the cellar of what is now Dowry House Retreat, along with layman George Guisborough who had also refused to sign the Act of Supremacy. Dating of individual parts of the building is difficult; nonetheless, wattle and daub walls were uncovered during renovations and part of one is exposed on the first floor. After the Reformation, the building underwent a series of evolutions as it was used for different purposes: for trading businesses, as a post office, a coffee shop and accommodation. The exterior of the building, facing onto the High Street, was given a brick façade in the 19th century. More recently, in 1982, Sue Ryder purchased it to provide a retreat house for her staff in this quiet, grace-filled place known as England’s Nazareth. In 2006 Peter Hoye bought the property and began renovating it to update the retreat centre for modern-day pilgrims. His dream was to have a religious community living on-site, praying in the chapel and offering hospitality. In 2016 he generously passed over the management of the retreat house to the shrine and Bishop Alan Hopes then invited us to run it. COLW promotes a vocational culture in the Church, accompanying others that they may imitate Mary in her Yes, her ‘Fiat’ to God at the Annunciation. It is this Yes to the divine will that allows the Word to become flesh in us, so that each one of us may become “another humanity” for Christ (St. Elizabeth of the Trinity ODC) and live in true interior freedom. Hence, the logo for Dowry House: The Word was made flesh and lives among us. This brings about the heavenly kingdom, where God’s will is fulfilled on earth as it is in heaven. When this abandonment to Divine Providence is lived with the joyful thanksgiving of Mary’s Magnificat, we give joy and glory to the Trinity, and become the saints that we are called to be. We journey from the moment of the Incarnation at the Annunciation to the missionary outreach of the Visitation, giving birth to Christ first in our hearts and then in the lives of others. The shrine offers at Dowry House a range of formation courses and retreats for those seeking to deepen their faith, details of which can be found on the website. There are 17 beautifully furnished bedrooms that can hold up to 26 guests, for whom all meals are provided. The Welcome Centre at the entrance offers resources for passing pilgrims to have a fruitful time in Walsingham and the gardens are being developed to provide outdoor prayer spaces for residential guests. The Julian Library holds a Marian collection of some 3,000 books ranging from art and history through to mystical theology. The Beckett Room is a reading room where residents can relax and the St Edward’s Conference Room, with its media facilities, sits larger groups of thirty plus for seminars. The cloister of the courtyard joins the main building to the Chapel. The plan for the beautiful chapel is to have a special tabernacle designed for Perpetual Adoration, since it is from the Eucharistic Heart of Jesus that all effective evangelization comes. As such Dowry House will be the praying heart of the shrine and a place for all people to encounter the Word made flesh Who lives among us.